Here’s a relatively short article with some simple ideas for preventing the useful items on your nightstand from flying away in an earthquake. I already described how I keep my flashlight easily accessible a few years ago. 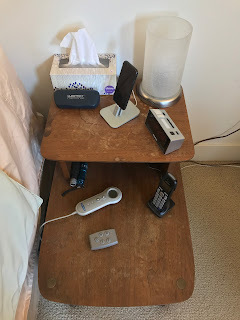 However, I also keep my eyeglasses and my cell phone on my nightstand when I’m sleeping, and it would sure be nice if they remained handy if a quake hit while I was in bed. My approach is not rocket science but I figured I’d share it. The astute reader will discern several things by looking at this photo of my nightstand. (1) It’s in terrible shape (it’s an end table from the 1970s currently in its 10th life), but that is not really relevant. (2) My eyeglasses case is right next to me under stationary conditions. (3) My iPhone is charging in a nice convenient stand. You can kind of see the flashlight on the lower level, but concentrate on the upper level. Here’s how those objects are held in place. First, the cell phone. Pretty simple: that charging stand is stuck to the surface of the end table with quake putty, since I never need to move the charging stand and it even makes it easier to remove the phone from the charger with one hand. I might have been hesitant to put quake putty on bare wood if the nightstand was some great antique, but considering my nightstand is a non-great “antique” full of water marks, I’m fine with it. Second, the glasses case. I like to be able to pick up the glasses case when putting my glasses into it at night or taking them out in the morning, so I didn’t use putty. One could potentially come up with a Velcro-based solution, but I decided to use magnets and my favorite 3M Command Strips (the sticky tape with a tab that you can pull to make it stop being sticky and release from a surface). In this case, I used the clear Command strips, so you don’t have ugly white tabs on the dark wood furniture. Again, I would hesitate to put these strips on good wood furniture. I used those strips to stick down a couple of strong magnets, figuring I’d attach other magnets or a metal plate to the bottom of the glasses case. However, as luck would have it, the glasses case was already paramagnetic so I didn’t have to add anything else to it. I just stuck down the magnets to the table, and now if I even put the case close to the right place and let go, it jumps right to where it should be; quite helpful in the dark. Now, these may still fly off if the quake is large enough, but it’s nice to know they are at least discouraged from leaving. Velcro might be safer, but I do like the idea of being able to pull the glasses case off without making an audible noise that could wake up someone else in the bed. The touch light visible in the photo is actually also stuck down with putty. None of the other objects are stuck down, like the wireless remove for my floor heater or the wired remote that adjusts the firmness of the bed. I’m sure that those reading this could easily come up with similar solutions on their own. The point of this little exercise is really to plant the suggestion in your head that it’s worthwhile to keep important objects at hand if a quake hits while you are asleep in bed. As I pointed out at the end of the flashlight article, this is all moot if the nightstand moves away from the bed, so you might consider discouraging it from sliding if necessary, perhaps by putting rubber non-skid pads under the feet. Of course, if these essential objects stay on the nightstand and you tumble out of bed, then I guess the joke is on you. Somehow, resorting to velcro pajamas and bedsheets seems like a bit much, although it could possibly benefit the space program.